Are you serious about plants? 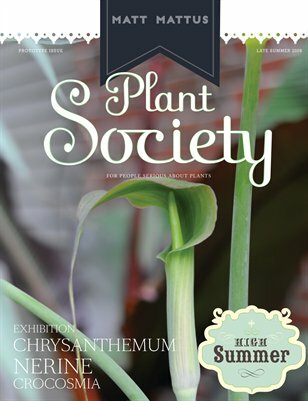 Matt Mattus' new magazine, PLANT SOCIETY will grow with your obsession. Inspired by his popular gardening blog, GROWINGWITHPLANTS.COM, this magazine explores the world and lifestyle of connoisseur plants, collectable plants, food, travel, design, home and garden decor and horticultural subjects not often explored in other journals. Late Summer issue explores cultivating potted Guernsey Lilies, (Nerine Sarniensis), Crocosmia, Rare Tuberous Geraniums, Rediscovering Exhibition Dahlia's and Chrysanthemums, and more.